Jimmy Dean lyrics are intended for your personal use only, he is an outstanding entertainer. You'll love playing and singing some of these old country song lyrics with chords, they bring back memories. Jimmy Dean came from a small town in west Texas and is a true country music singer and quite the businessman. Jimmy loved being a television host as well as doing some acting. 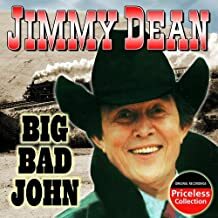 He will always been well known as the founder of the "Jimmy Dean Food Company", but he first rose to fame for his ever famous hit "Big Bad John" and his many television appearances. He helped several artists get their start including Patsy Cline and Roy Clark.